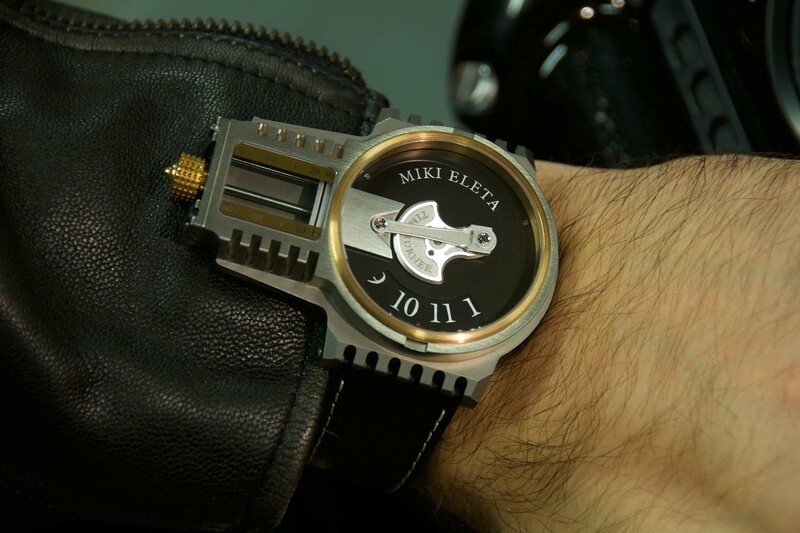 Somewhere in between the made-up worlds of Rube Goldberg and Roald Dahl there exists a place where the creations of Miki Eleta would seem at home. HERE, in THIS reality, in OUR world, Miki Eleta’s kinetic sculptures look totally otherworldly and very special indeed. Each of the different independent watchmakers visiting Shanghai with the AHCI last October demonstrated not just their timekeeping instruments – but also their personalities. Buying from a major brand has a certain level of anonymity built into it; you never get to know the person building your watch and the company doesn’t really get to know you as a person. 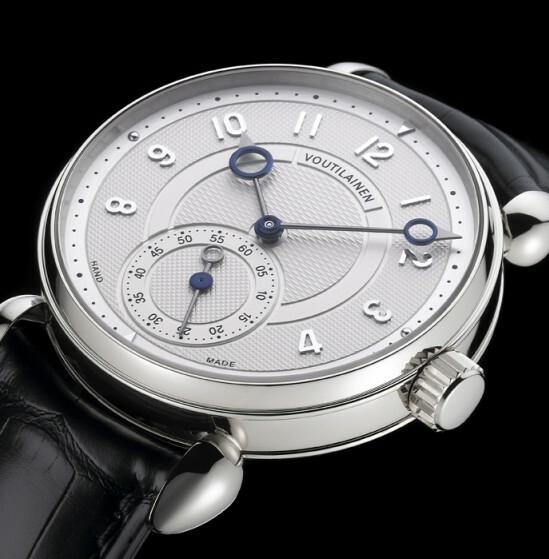 Independent watchmakers don’t function that way. 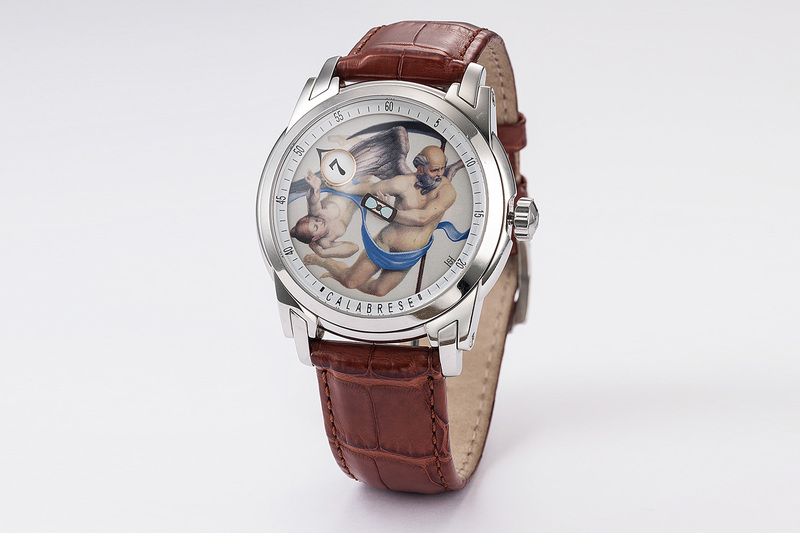 When you purchase or more likely commission a piece from an independent watchmaker there are few barriers or buffers between you and the artist. This works out to be mutually beneficial because you as a patron gain confidence in the acumen of the artist making for you and the watchmaker learns about some of the hidden idiosyncrasies about the patron that he might be able to capture and play off of in his or her design. In this type of setting the richness of the imagination of the creator and the client can come to the fore and what they produce can be truly spectacular! So it really starts with an imagination; an imagination fused to a solid technical background. Enter Miki Eleta! 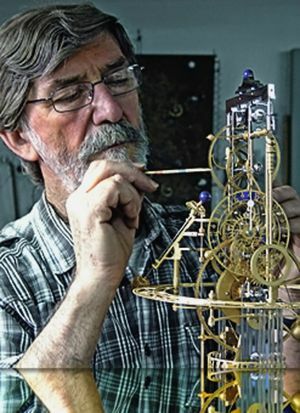 The Bosnian born Eleta has been working in Switzerland for the past 40 years building timepieces and ‘kinetic art’. His question: “What exactly is a clock?” is not just a philosophical statement; it’s an ethos. It says let me dismantle ‘clocks’ in general. Let me dismantle ‘time’ in general. Let me dismantle the way we see and interact with each moment of each day. Now, let me rebuild it so that each of the seconds that make up a minute and minutes that make up an hour and hours that make up a day can be in some way unique and special. Eleta’s works live up to that ethos. 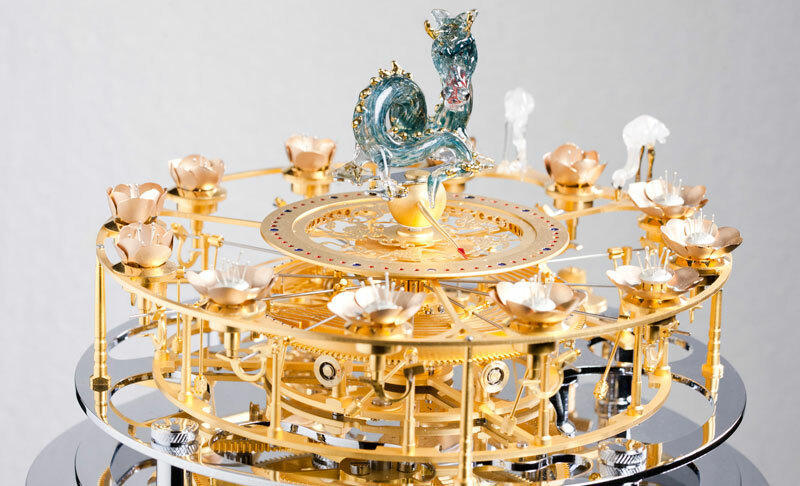 His Flower Clock, which was featured prominently at the entrance to the AHCI installation at the October show is just about as UNclocky as a clock could be. 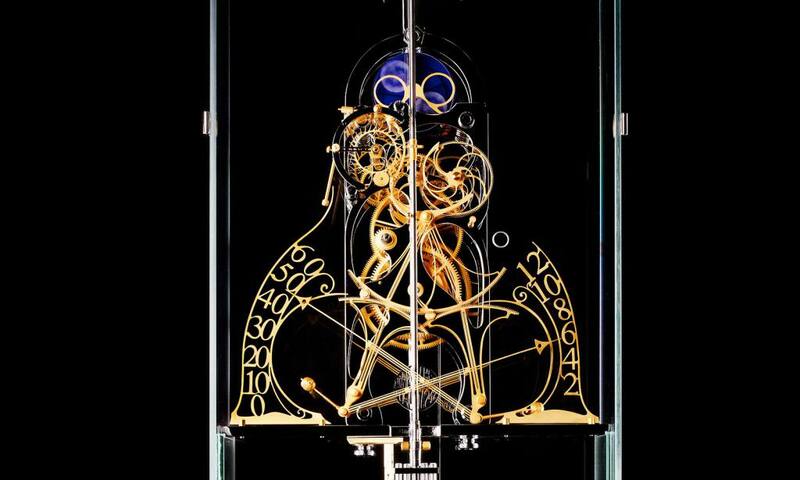 Looking like something that should be at the center of a spaceship’s flight deck or equally at home in the private chamber of a Wizard, the only thing linking the totally bespoke Flower Clock to a clock you may have seen before is the pendulum and winding weights. Without the pendulum and weights you are looking at ‘other’. It is not just a timekeeper. It is not just a sculpture. It is simply ‘other’. With a whirling array of flowers denoting the hours that open and close mechanically as time progresses from morning into night it does tell time. But there are hand formed cranes around the dial, reminding us of the connection between flowers in bloom and nature. But there is also a rather mysterious dragon, hinting perhaps at different cycles – lunar cycles – cosmic cycles? Things we may not recognize our connections with but that certainly push and pull on our human experiences each and every day. Eleta’s Worldtime clock is slightly more mundane… it’s wall mounted and has a dial. From those two points everything else is different. The brass and blue glass face is a 24 hour dial that circumscribes the hand made Earth within it. The dial mimics the true rotation of the earth by telling time in a counter-clockwise pattern! 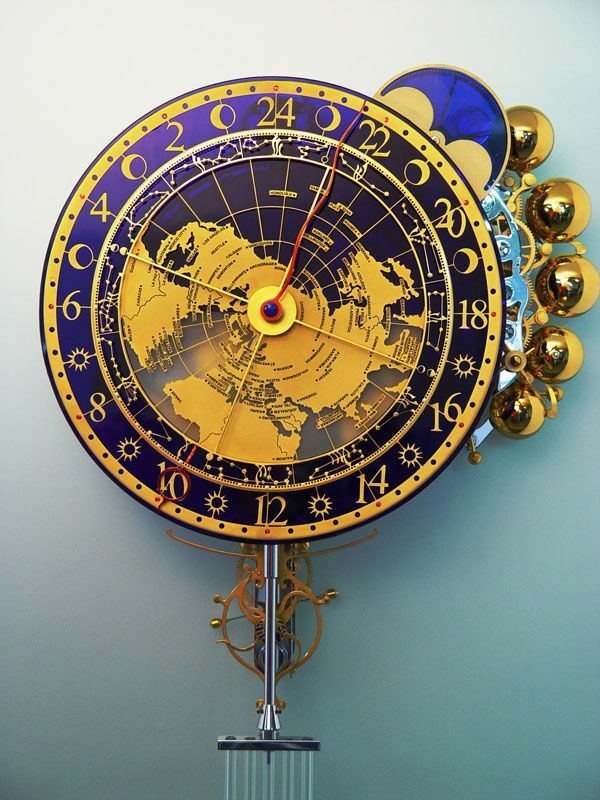 The Worldtime clock doesn’t’ simply tell the time in any one of the 100 (!!) cities on it’s dial, it also shows the day, the date, the season and the astrological star signs as well! There is a moon phase indicator – of course – calibrated to stay in phase without adjustment for 128 years! And then there is the chiming mechanism. Indeed, Miki Eleta is a bit of a complicated person. His art is complicated – frankly – his business cards are a grand-complication unto themselves simultaneously displaying times in all the major cities of the world! I do not posses the technical acumen to disassemble Miki Eleta and reformat him! But then again – I do not need to – built into every new piece that he creates is a sense of self-discovery. It must challenge him as an artist and therefore it challenges us as on-lookers. I would like to offer a special thanks to my friend Marc Jenni who – in spite of being swamped with people vying for his attention – acted as an interlocutor between me and Mr. Eleta. 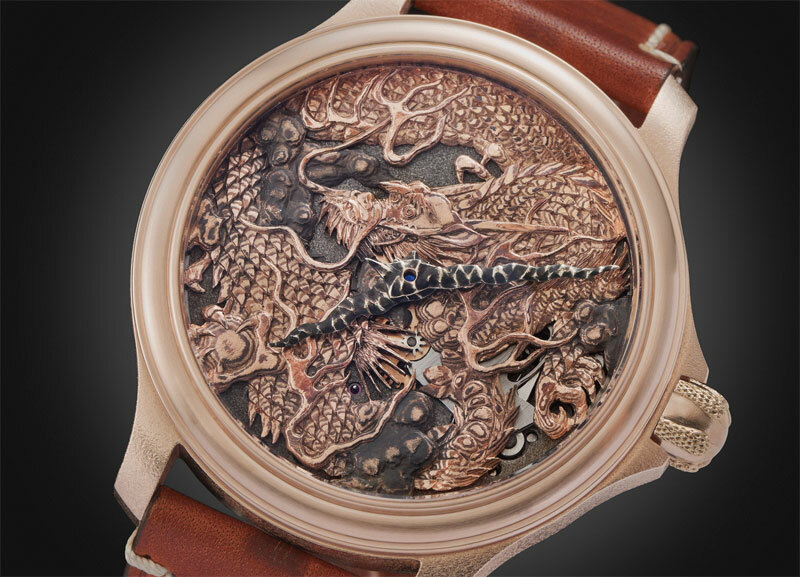 This article is written by Mario Squillacioti, contributing writer for Monochrome-Watches. Svidja mi se onaj bijeli labud! Hvala! Bilo mi je zadovoljstvo.